This cheerful design by Emily Henderson is basically candy for the eyes. Despite the vast array of colors, patterns, and materials in the space, cohesion abounds — check out how every vibrant hue matches in tone and each piece of furniture coordinates in structure. The gallery wall is a near-perfect reflection of the rug's variegated palette, and both appear to include splashes of the emerald green and hot pink shades in the surrounding midcentury sofa and chairs. And while bold furnishings run the risk of being over-the-top, the mod coffee table keeps the look centered with its natural wood finish and straightforward features. If you're considering bright upholstery as a focal point to your decor, then be sure to add in organic materials. It's a no-fail way to keep everything grounded in sophistication. 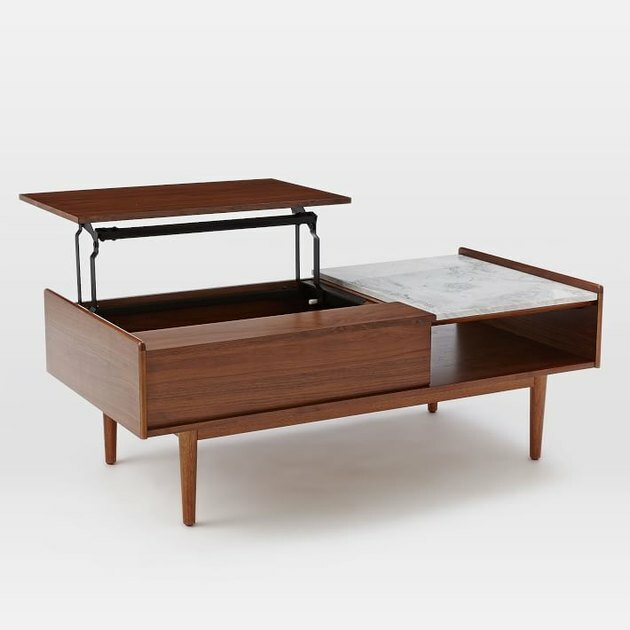 Incorporate some stylish natural wood into a confident aesthetic with this midcentury coffee table.